Reprinted with permission of Professors Neal and Ann Koblitz from the Kovalevskaia Fund Newsletter, Vol. XII, No. 1, January 1997, pp.5-6. 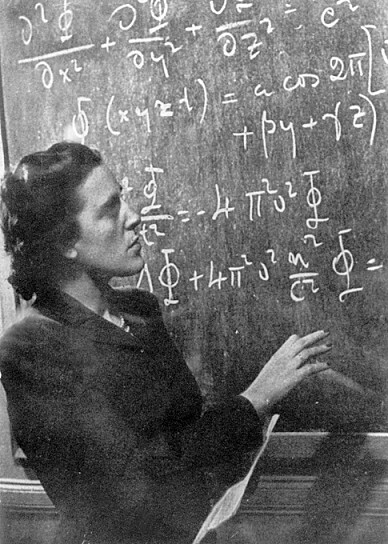 Cora Ratto de Sadosky was an Argentinian mathematician, an inspiring teacher who devoted her life to fighting oppression, discrimination, and racism, and to defending the right of all peoples to self-determination. Born in 1912 in a middle class family, Cora Ratto graduated from the University of Buenos Aires, where she was a leader of the Argentinian University Student Union (FUA). Actively opposed to Nazism and Fascism, she was prominent in the Argentinian solidarity effort in favor of the Spanish Republic, and in the denunciation of the imperialist Chaco War, which was forced on Bolivia and Paraguay by the U.S. and Great Britain in the early 1930's. During the Second World War, immediately after the Nazi invasion of the Soviet Union, Cora Ratto de Sadosky created "La Junta de la Victoria" (The Victory Union), a women's organization devoted to helping the anti-Nazi war effort. In 1945 "La Junta de la Victoria," of which Cora was Secretary General, had 50,000 adherents (in a country with fewer than 12 million people), and had contributed hundreds of thousands of dollars to the U.S.S.R., Great Britain, China and the United States in clothing, food and strategic materials for the fighting troops. Not only was the "Junta de la Victoria" significant for its solidarity against the Nazis, but it was the first women's mass organization of its size in Latin American history. In 1945, as representative of her organization, Cora was a founding member of the International Women's Union at its first meeting in Paris, presided over by Pasionaria. In 1946 Cora and Manuel, with their then little daughter, went to Europe to continue their mathematical studies. In Paris, Cora worked under the direction of the famous Professor M. Frechet, but did not complete a doctoral dissertation at this time, because the family left for Italy, where her husband received his training; he later became the first Latin American specialist in computer science. They returned to Argentina in a period of turmoil and political repression in the universities, and Cora worked at a commercial enterprise to sustain the family. When the Argentinian universities regained their autonomy in 1956, Cora and Manuel were part of the team that built a modern School of Sciences at the University of Buenos Aires. In 1958, at age 46, Cora received her doctorate at the University with a thesis on hyperbolic singular integrals. From 1958 to 1966 she was an Associate Professor of Mathematics. She initiated a celebrated series of research publications (the first volume, "Mathematics and Quantum Physics," was written by Laurent Schwartz) and helped organize advanced courses for several generations of mathematicians and scientists, many of whom later became leaders of research communities in various parts of Latin America, North America, and Europe. Cora was the co-author, with Mischa Cotlar, her doctoral thesis advisor, of an "Introduction to Linear Algebra," a remarkably modern and rigorous text, the first of its kind in Spanish. She also developed texts for preparing high school teachers. One of her most important contributions while at the University was to create the "Albert Einstein Foundation," aimed at supporting talented mathematics and science students in need of financial help. Her fellowship and mentoring program helped hundreds of young Argentinians, and was the first stage in establishing a university-wide scholarship system. In 1966 the first of a string of increasingly repressive military dictatorships took control of Argentina. Following a violent assault on the School of Sciences by military and police, 400 faculty members resigned their positions at the University of Buenos Aires. After leaving the University, Cora retired from mathematics research and teaching, and concentrated her efforts on denouncing the human rights abuses perpetrated by the military. In 1965 Cora created and co-directed the monthly magazine "Columna 10," with the primary aim of raising the awareness of the Argentinian public about the Vietnam War, which at the time barely reached the pages of the local newspapers. "Columna 10" was a landmark publication, exposing the secret war waged by the U.S. Green Berets, the effects of defoliation, and the human rights atrocities committed by the Saigon regime and the American Expeditionary Forces in Vietnam. Under threats on their life, Cora and her husband left Argentina at the end of 1974, and lived in exile, first in Caracas, Venezuela and then in Barcelona, Spain. Her dream of returning to her country was never realized. She died in exile on 2 January 1981, a day before her 69th birthday. Her legacy resides in the many students she inspired and helped, and in the many friends around the world who saw in her an example of integrity, farsightedness and commitment to change. Her enthusiasm for knowledge, her passion for justice, her human warmth, and her love for mathematics justify our naming for her a mathematics award for young women, in a country whose struggles she fervently supported, and whose determination she deeply admired.